Tornadoes occur in the United States more than in any other country in the world. 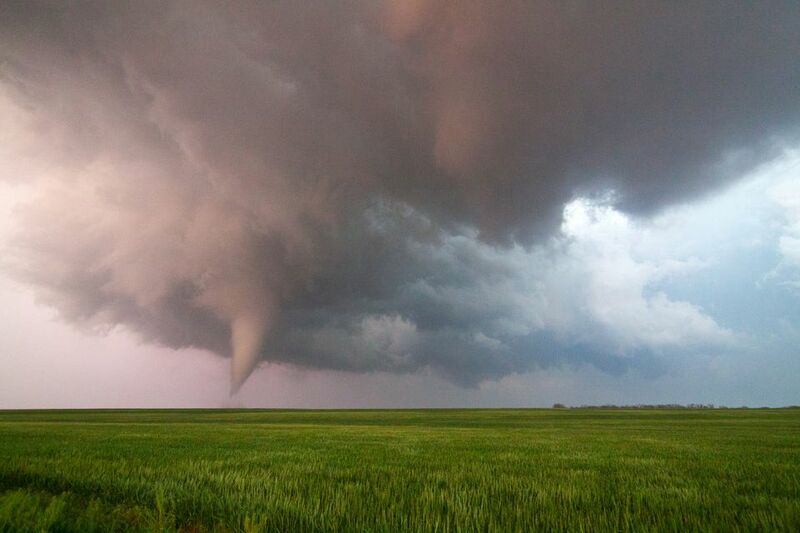 Tornadoes are a terrifying and legendary part of spring in the Southern Plains, which has earned the nickname Tornado Alley because this region gets by far the biggest number of these storms. Tennessee is part of what's been dubbed Dixie Alley, along with Louisiana, Mississippi, Alabama, and Georgia. The spring tornado season hits Dixie Alley hard, but it also gets tornadoes at slightly different times than Tornado Alley because it is in a warmer section of the country. And that's why it's a more likely location for tornadoes in November, which is called the second tornado season. Tornadoes always form inside a very strong thunderstorm. But there has to be instability and wind shear in the lower atmosphere for this monster weather event to occur. If you've ever been in a location where there is a tornado, you no doubt noticed that it was extremely warm and humid at the time. This is called instability. Wind shear means the wind is changing direction and getting stronger at the same time. These conditions almost always come together as a cold front approaches. Tornadoes most often form on the boundary between the dark clouds rising high and the brighter clouds below them. This makes spotting the twister's characteristic shape easy. Tornadoes are unpredictable and can happen any time of year in Tennessee, although almost half of Tennessee's average number of tornadoes a year, 29.1, generally occur in April and May, with April averaging 8 and May averaging 6.1 tornadoes a year, according to the website USTornadoes.com. The chance of a tornado drops considerably from June through December, with the exception of November, when the chance of a tornado in Tennessee is about the same as it is in March, the start of the spring season. Both these months average 2.8 twisters annually. Great music is the main draw in Nashville all year long, but it reaches a crescendo in June with the CMA Music Festival, the Bonnaroo Music and Arts Festival, and Country Fest, and the Bayou Country Superfest happens in May. And if you're visiting Nashville in May, you might want to drive a few hours and catch the Beale Street Music Festival or the World Championship Barbecue Cooking Contest in Memphis in May. If you are visiting either of these cities for these special spring events, you should be aware of the weather because that's high tornado season, especially for the May events. Keep your eyes on the sky and your phone's weather app and rearrange your plans as required. These dangerous storms pass quickly and won't usually be disruptive for more than a few hours at most. The National Weather Service issues a tornado watch, usually for a large area, when the conditions are present that are conducive to the formation of a tornado, but a tornado is not threatening the area at that time. A tornado warning is issued when a twister has been visually spotted or is seen on radar. If there is a tornado warning, you should take cover immediately. Every state, including Tennessee, has tornado warning sirens that go off when the National Weather Service has issued a tornado warning. But to make sure you know about a warning and can continue to get information about its status, it is smart to have a weather radio that operates with batteries and also a weather app on your smartphone that you've set to send you notifications of bad weather and warnings. If there is a tornado warning, the best place to take cover is in a basement or storm shelter away from windows. If you don't have a basement, go to the lowest floor of the house or building and stay in the center of the room, away from windows, doors, and outside walls, until the storm has passed. An interior room with no windows or outside walls like a bathroom, closet, or inner hallway is the safest place to be if you do not have a basement. If possible, get under a heavy piece of furniture, such as a desk, and cover your head and neck with a blanket. If you are in a hotel, go to the center of the building on the lowest floor. This is most likely the centermost area of the lobby. Cover your head and neck with your arms and get under a heavy piece of furniture if possible. If you are in an office building, go to the basement or an inside hallway that is on the lowest level of the building and cover your head and neck with your arms. If you are outdoors, try to get into a building if possible. If that's not possible, lie in a ditch or take shelter on the side of a strong building and protect your head and neck with your arms. How Is a Tornado Watch Different From a Tornado Warning? What Should You Do If You're in an Earthquake?